Deep sea vents are an interesting subject of study for many scientists. Astrobiologists believe that deep sea vents play an important role in the ocean’s chemistry, temperature and circulation pattern. They believe that they may even give information on the real origin of animal and plant life on earth, plus the existence of life and its origin on other planets. 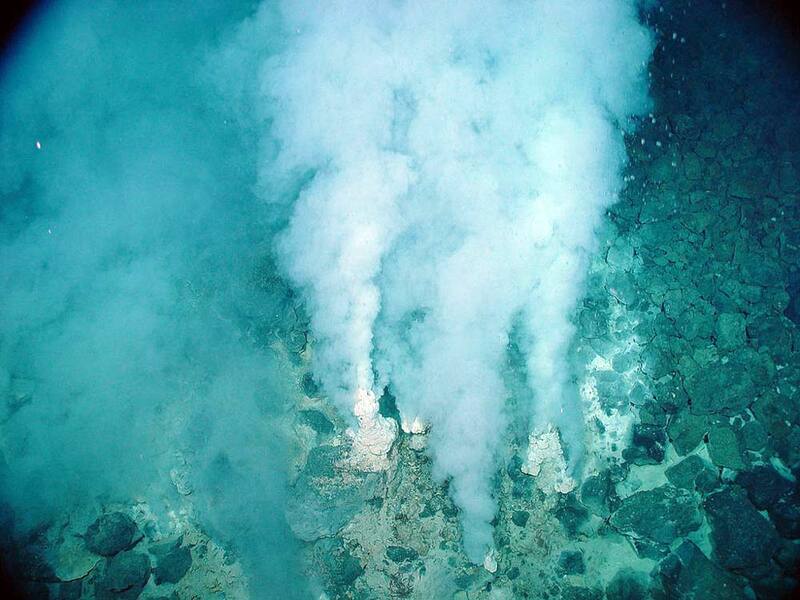 A hydrothermal vent, also known as a deep sea vent, is basically an underwater geyser. They expel water and gas from the ocean’s floor. Just like other geysers on the earth’s surface, the vents are the channels to pockets of gas and water that are buried inside the earth’s crust. Such pockets are heated at very high temperatures by volcanic activities in the crust. They are then put under great pressure; this causes the water and other gases to find their easiest way out. They finally erupt in the form of intermittent waves from vents. The vents on the ocean floor and those on the earth’s surface are in two different environments. On earth’s surface, water escapes as steam explosions and the gas flows out unseen by human eye. However, on the floor of the ocean, there is great pressure; this pressure weighs down on erupting gases and steam; this considerably slows flow from the deep sea vent. In the ocean, the gases can be seen as some streams of cloud and bubbles. The heat from the vents stays close instead of rising; this provides hot water that the ocean dwellers survive in. The vents along the floor of the ocean do not have to depend on the inner wells of the ocean water to erupt. Basically most of water expelled by these vents was originally the ocean water that sunk through cracks. These cracks were caused by great straining and movement of the tectonic plates. The water sinks very deep inside the crust, here it is then heated and then changed by pressure and heat from the magma. It then joins the nearby minerals and then becomes saturated with the mineral particles before it finally gains lots of heat. When it’s totally heated up, it forces its own way back up inside the ocean. The water is now very rich in minerals and energy-rich in its own heat. This makes a great breeding ground for the different types of life that lives deep in the ocean and is found no other place on the planet. Mineral deposits that are carried by most of these vents create columns where they are located. They channel their heat and the gas in chimneys. Such chimneys can grow very fast, up to one foot a day; they are among the primary indications that scientists have been using to find the amazing hydrothermal vents. Deep sea vents were first discovered in the 1970’s. The scientists were very amazed that there could be life in such depths with no presence of sunlight. The gases and heat from the deep sea vents are an indication that life on this planet can exist without sunlight. Generally, deep sea vents are commonly found near volcanically active areas. This includes areas where the tectonic plates are drifting apart, hotspots and ocean basins. They are known to exist in the Atlantic and Pacific oceans. Most of these vents are found at a depth of over 6,800 feet. The first deep sea vents were found in 1977 located off the coast of Ecuador and east of the Galapagos Islands. The vents here emit high temperature water and mineral combinations that are able to sustain life in the deep waters. These hydrothermal vents were created due to a complete separation in the Farallon Plate. This split in the plate created what are now called the Nazca and Cocos Plates. The vast majority of these vents are more than 8,000 feet below the ocean surface. Due to the vents’ emissions, the waters here are rich in sulfides, manganese, zinc, iron, copper and mineral anhydrite.